I was born in Wellington and spent the first 30 years of my life growing up and living in Lower Hutt. After serving an apprenticeship with the railway workshops I joined the Wellington Free Ambulance. This began a career in ambulance management with 18 years of service in the Wellington Free Ambulance, 13 years as Chief Executive, of St John Ambulance Midland Region, based in Hamilton, and after transferring to Auckland, a further 10 years in senior operational roles in Northern Region. 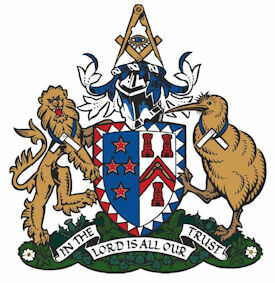 My Masonic career has spanned 38 years and included membership of Waiwhetu Lodge (now Hutt Valley Lodge), Hillcrest Lodge in Hamilton and Arawhaiti Lodge in Auckland. 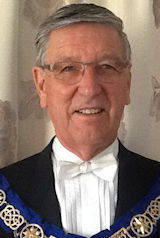 I have served the role of District Grand Director of Ceremonies, and District Grand Master, for Auckland West District. I am supported by my wife Kate and have two children, and we have five grandchildren between us. My Daughter is an accountant with Perry Metals in Hamilton and my son is the General Manager of Ingram Prestige, also in Hamilton. Kates son works in the film industry and her daughter is in HR management and they live in Hawkes Bay and Auckland. I continue to work in a part-time role with the Order of St John as the Head of Order Matters for the Order in New Zealand. As I prepare to commence my role as Divisional Grand Master I am also planning to relocate to Hamilton. We are having a new house built in Hamilton and expect it to be completed and ready for us to move in March 2017.